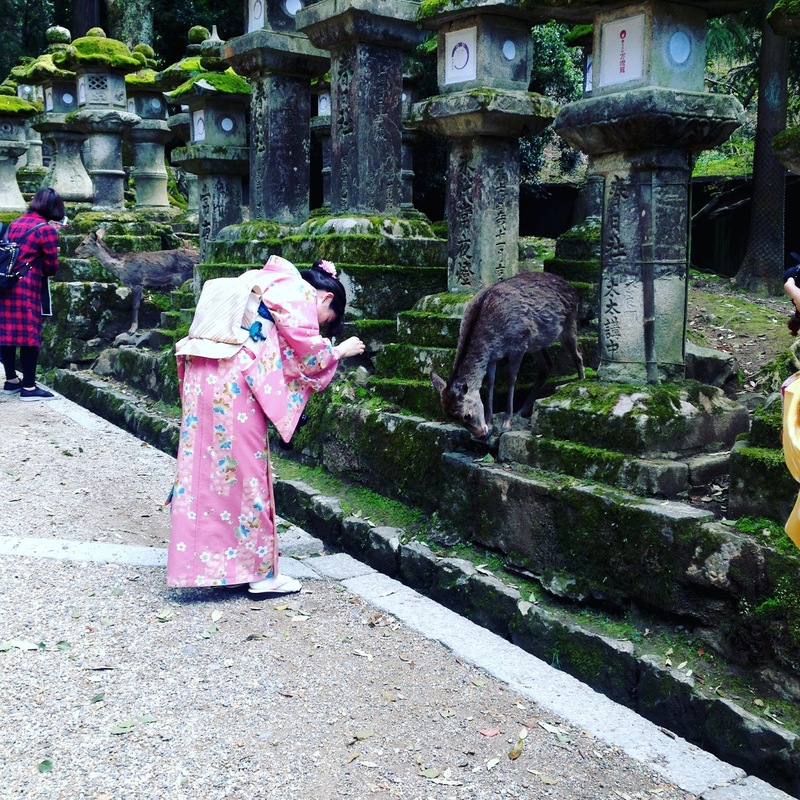 So we decided to make good use of our Japan rail pass now it was activated and did a day trip to Nara from Kyoto. Using the rapid train the journey took about 40 minutes. 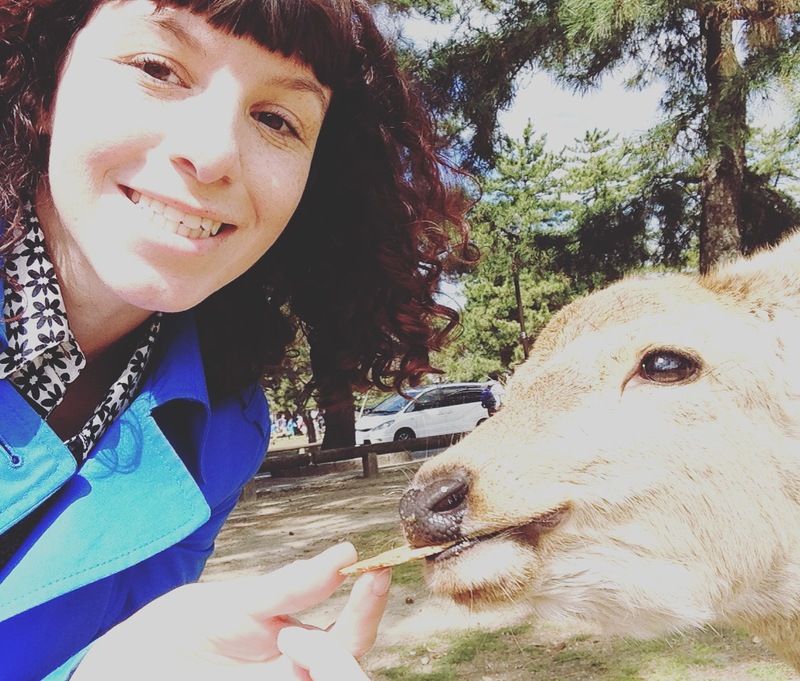 From Nara station we were able to walk to Nara Park, famous for its wild deer which are seen as national treasures. 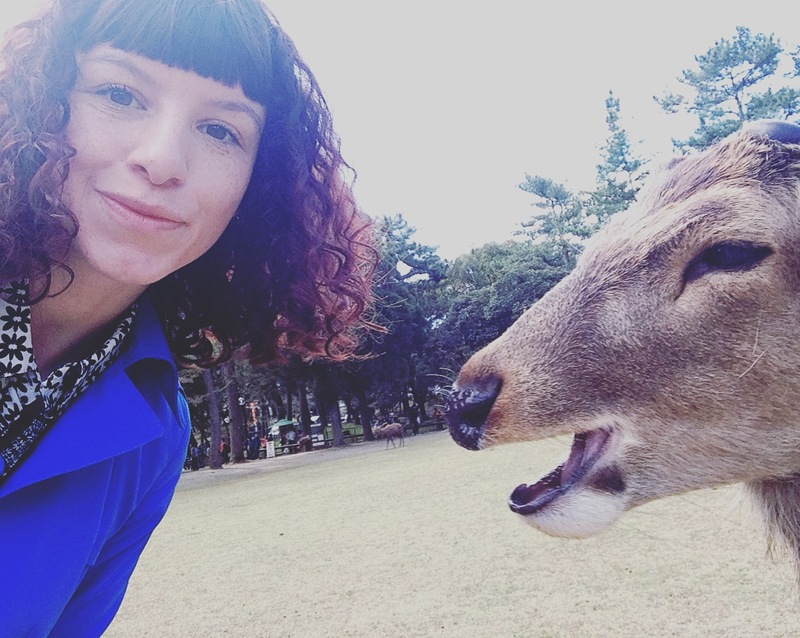 For 150Y there are various stalls around the park that sell crackers for you to feed the deer with. Don’t do what we did which is get the crackers and instantly get attacked by a million deer. What we did after that was hide the crackers immediately in our pocket and wander off to a quiet area before getting them out. 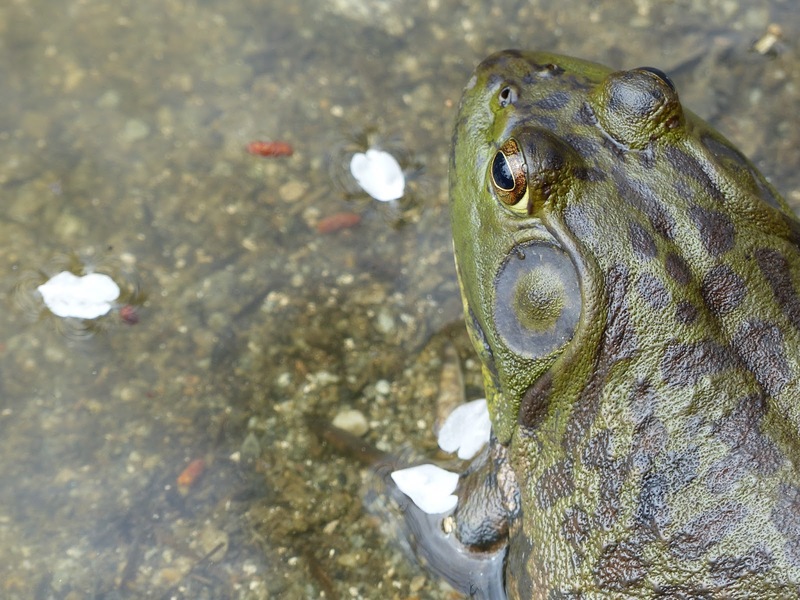 It is amazing to see these usually timid creatures be so confident. There were some really boisterous deer that seemed to bully the others. I tried to find the little Bambi looking ones to feed. They were so adorable. I really could have packed one in my suitcase. I spent about 600Y on crackers because I was enjoying it soooo much. It was a real highlight of the holiday. 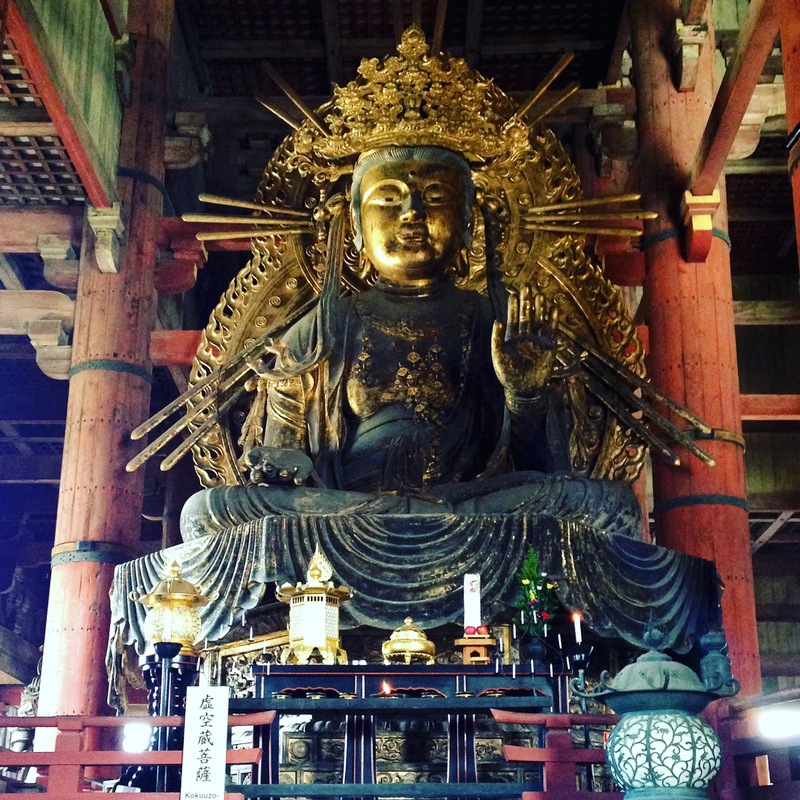 We then walked to Todai-ji temple, which had a 500Y entry fee. It was constructed in 752 as the head temple of one of the schools of Buddhism. 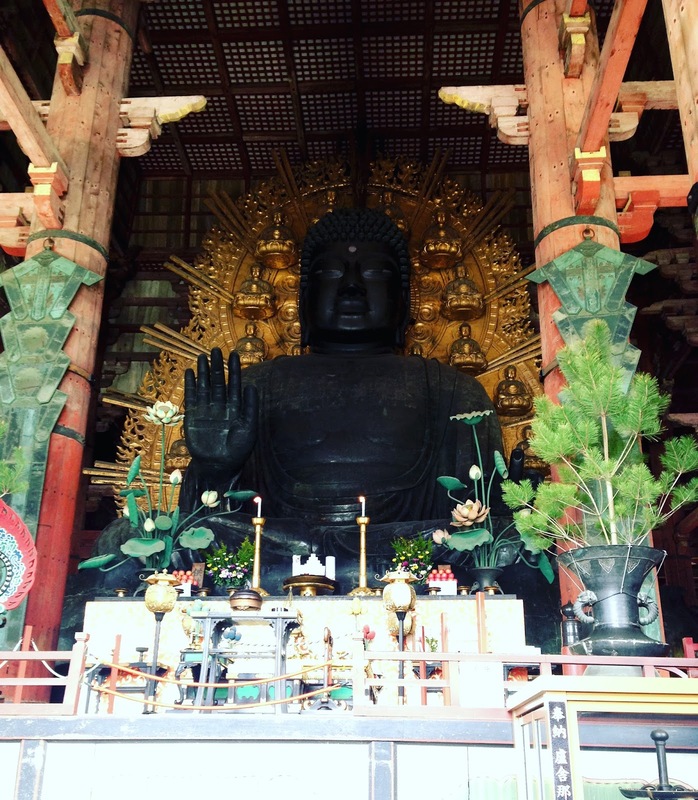 It was unbelievably grand, the size was just enormous and easily the largest temple we saw the whole time we were in Japan. 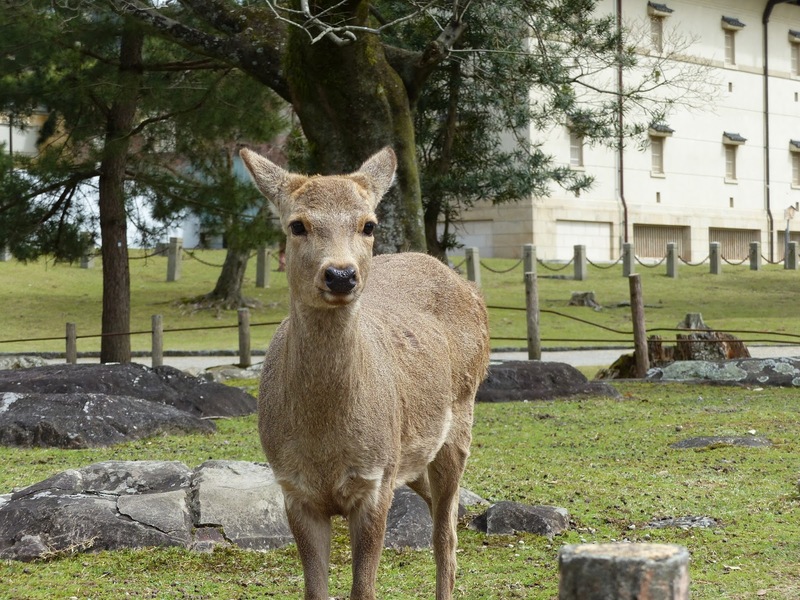 It was considered so powerful it was actually the reason the capital was moved from Nara, because it was seen to have too much influence on the government. 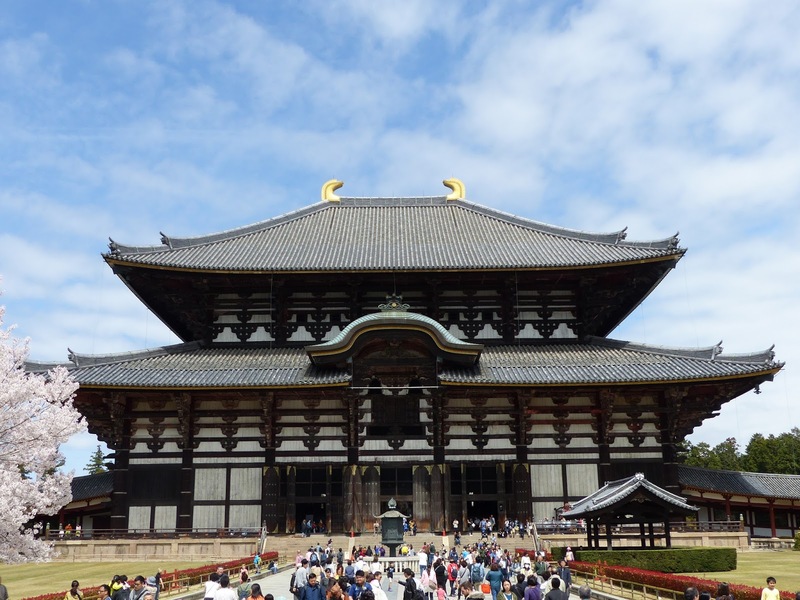 The building is the largest wooden building in the world and inside sits one of the largest bronze Buddhas in the world. The scale of everything you see here is just so impressive. You cannot help but think ‘wow’. 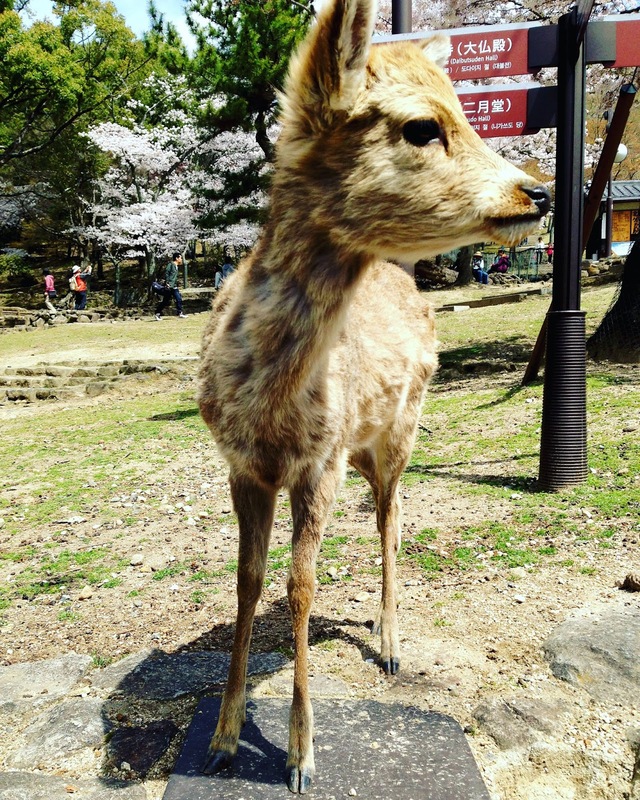 Already I started to realise that Nara was so much more than just deer. We found a cute little temple, of which I don’t know the name, but it had some lovely cherry blossom and a little pond which was filled with frogs. The spring breeze was blowing the cherry blossom through the air, it was all rather magical. 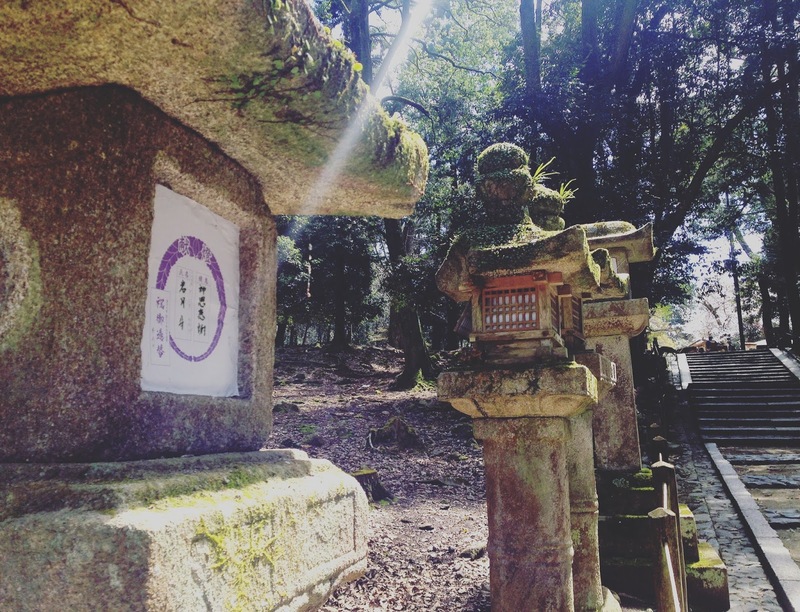 We then walked up to the Kasuga Taisha shrine which is known for the hundreds of lanterns that lead up to the shrine. It was the most beautiful walk. 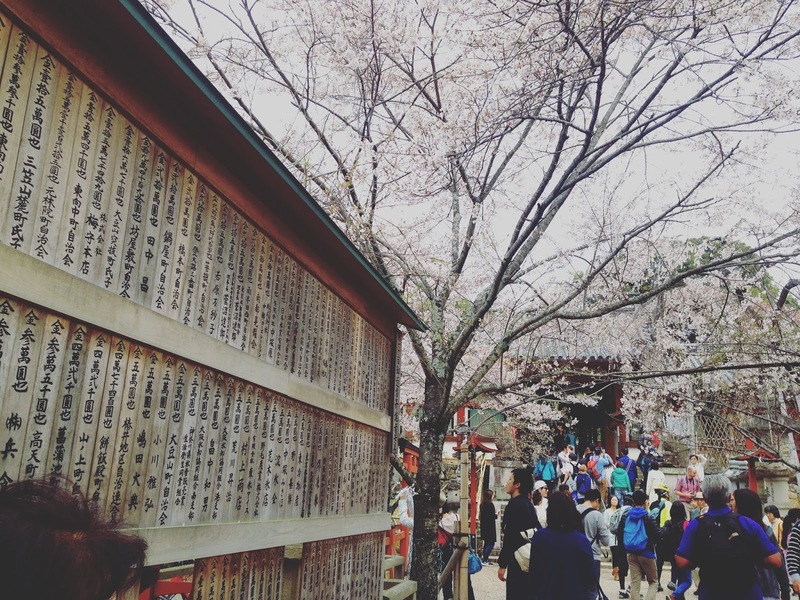 It sits in a forest that has over 175 different types of tree and there is so much to see in the lead up to the shrine. We were so lucky the sun shone down on us all day. There were more deer to see wherever we looked, lurking behind the lanterns. 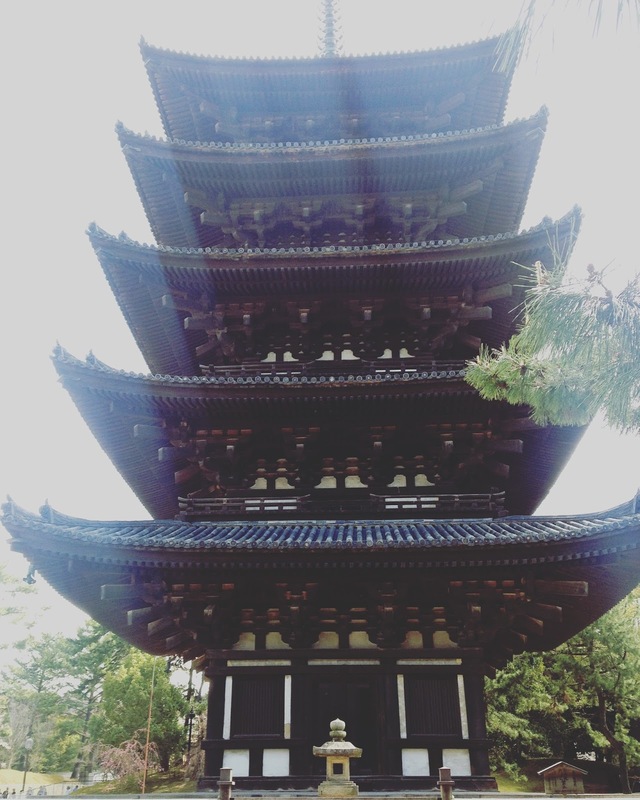 Afterwards we walked to the Kofukuji temple which contained 2 amazing pagodas. Unfortunately part of the temple was being constructed but I still felt it was worth the visit. I think the architecture of a pagoda is pretty beautiful to see. By this point we were pretty hungry and ready to get something to eat. We stopped at Kameya, which was just by the temple. 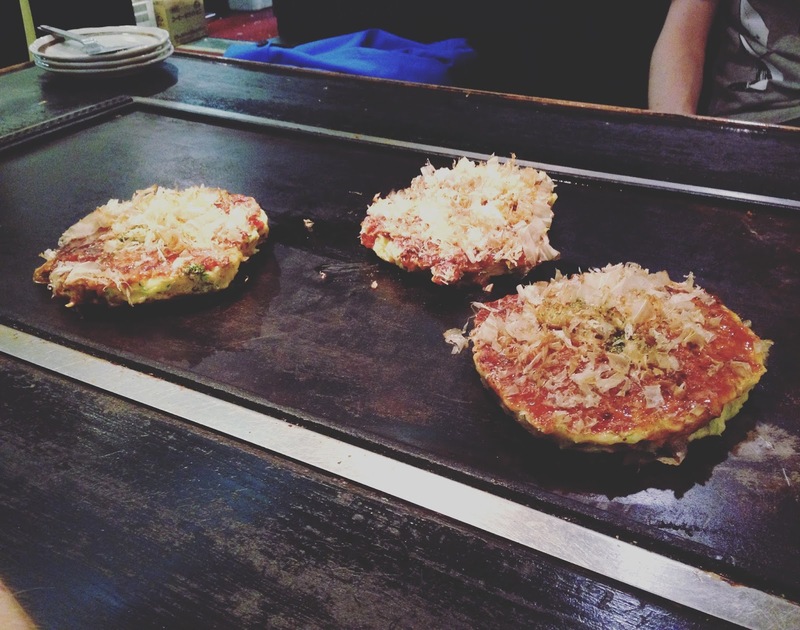 It specialised in Okonomiyaki, which is a type of savoury pancake. It consists of egg and shredded cabbage and ours was served with almost some kind of soy sauce on which was just delicious. It was very novel because we had a hot plate in the middle of the table so we could grill it ourselves. It was an amazing meal. After lunch we headed back to Kyoto. 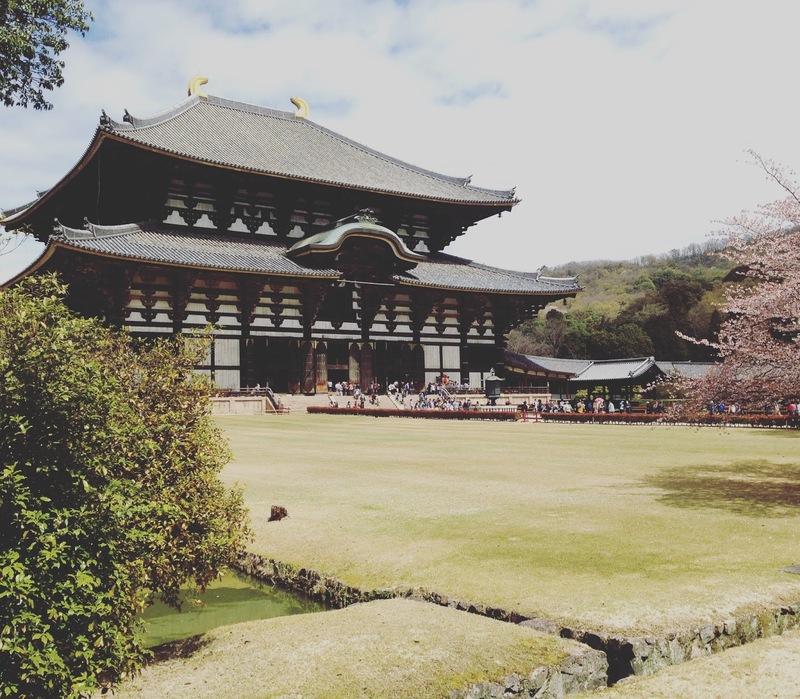 I found Nara such a wonderful place with a lot to offer. It was incredibly pretty and I think it would be a great place to spend a night. 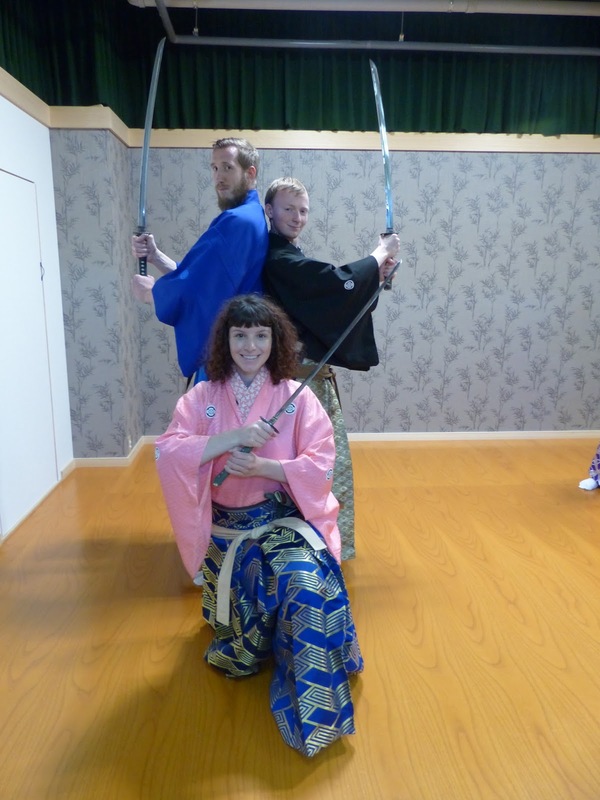 Once back at Kyoto we headed to the Samurai Kembo school. It was only a short walk from our hotel so was an easy find as we had spotted it the previous night. 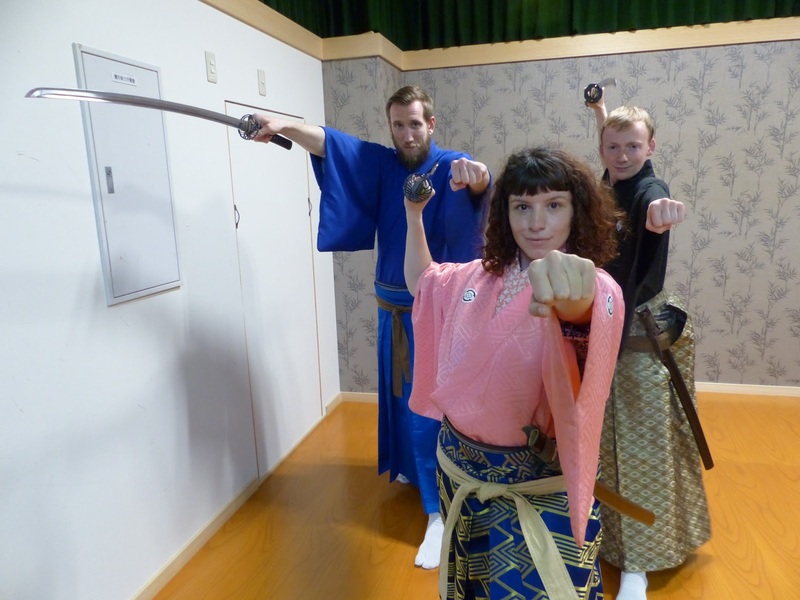 First of all we started with a one hour samurai demonstration and alongside the actual physical swordplay we also learnt about the origins as well as the values and ways that were held dear to them. It was really interesting. We then had a 2 hour lesson to ourselves! We even got the chance to dress up which was very fun. It was really amazing, our instructor was absolutely fantastic and was great at helping us out if we needed it. It was surprising how physically tiring it could be but I left it feeling really empowered. 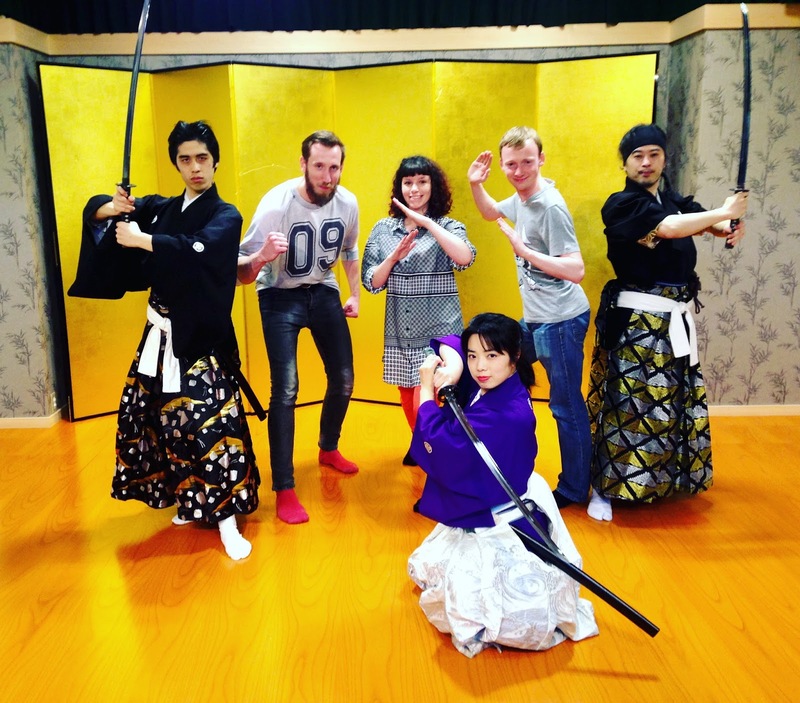 All of us majorly wanted to buy a sword after the session! After the lesson we further explored the shops of Kyoto. I had bought way too much stuff and had to buy an additional suitcase to bring my stuff back with me. Japan is certainly the kind of place where you need to give yourself the chance to bring stuff back. If I went again I’d bring basically nothing with me but an empty suitcase! I reckon you could! They might give your shirt a little nibble though haha, I lost a button!